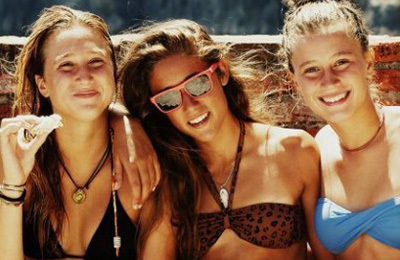 Cantabria Teens Surf Camp is located at north coast of Spain at 20 meters from beach and only 30 minutes from Santander Airport and we will take care about everything from the pick up until the drop off, no change of stress. The accommodation is beautiful, it has a lot to do around, sports court ( soccer, basketball, tennis), big green area with barbecue, ping pong tables, inviting swimming pools and much more! Parents and caregivers can be totally unconcerned, teenagers are supervised 24 hours per day, for surfing lessons we have professional surf coaching, and the friendly staff organize plenty of activities, prizes, gifts and lots of fun to make everyone happy. Unforgettable experience!! It is not only Surf, a lot of different activities and the main goal is to have fun!! The Teens will have health breakfast with milk, cereals, biscuit, juice. After surf lunch will be served as no one leave the table hungry! Afternoon snack with sandwich and fruits and dinner to finish the day with great Spanish food. The Camp also offers a minimarket, so we advise teens to bring some pocket money to buy some treats. Each class lasts 2 hours and includes all the material contracted. Students are separated into age and grade groups based on what we consider to be safer for them. The Camping is located on Ris beach, in the tourist town of Noja, within the Region of Trasmiera. It is a wide shell-shaped beach. This enables people to enjoy more than 40,000 square metres of beautiful fine sand at low tide. When there are spring tides, the Island of San Pedruco can be accessed by foot. Here you can find a small medieval chapel, wild fig trees and thousands of seagulls. The Island of la Oliva is next to this beach, and the rocks of Garfanta, Águila, and Moja de Rabo are located at the back. The promenade that goes along the coastline from this beach to the beach of Trengandín begins here. There are many coves along the route, which passes through a stunning pine forest and leads to idyllic places such as Punta de la Mesa or Pombera beach. These marshlands form the main wetlands of the Cantabrian Coast. This Reserve, apart from being rich in marine wildlife, is a place of refuge for migrating birds coming from the North and centre of Europe, on their way to warmer places. If the teen is coming by themselves, the best option is our private transfers from Bilbao and Santander Airports, train stations and bus stations it has an extra coast, but gives you the peace of mind. If you can choose Santander Airport is only 35km far, Bilbao is 90km far from the Camp. To the airport of Santander and Bilbao, there are daily flights from different points of the peninsula and Europe. Search on Rynair, Iberia and Vueling. By the A8 motorway you can arrive from Santander or Bilbao, take exit 185 Beranga, continue to Meruelo and turn off to Noja. Check the Alsa lines where you will find daily journeys from Bilbao or Santander. "Simply great, it was the first contact with the surf and they're very engaged, eager to get back to surfing and all thanks to the teachers and the organization. 10 for instructors, both on a professional level as in personal, our kids are thrilled. Breathe very good vibes in this school, and make you feel very comfortable. They'll be back!! Thanks!!" "I can only say that is one of the best experiences of my life!!! Surfing here is magical, the mixture of monitors and students, ris beach, its waves and the moments and memories for me... exceptional places to enjoy with any person who wants to have fun and surf." "Without a doubt, we will repeat! The sympathy and super professional staff, always waiting for you to enjoy. The facilities and the first quality material. I Super recommend !!" "I have no words to thank the treatment I received. It has been a big plush to enjoy and learn a few pieces with professionals like you. Thank you for making it easy to complicated, thank you for that patience, thanks for affection, thank you for each and every minutes dedicated...... It has been a dream, a dream that deserves to be repeated!"